Yesterday’s Masters mayhem is the latest proof that journalists can’t control the weather. They can only do their jobs to keep the public safe and informed. Over the weekend, WYMT anchor Steve Hensley realized two other things: Mother Nature is unpredictable and the job can be dangerous. 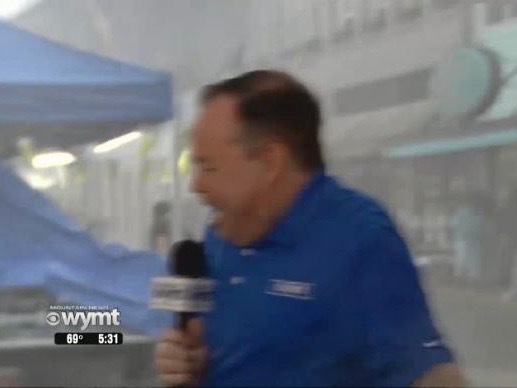 Hensley was live covering the Hillbilly Days Festival when a violent storm rolled in, just 20 seconds before the top of the show. “We’ll do the best we can here. I hope you can still hear me,” he said. It wasn’t long before a wind gust came through. Hensley had to toss it to the studio and run for cover.